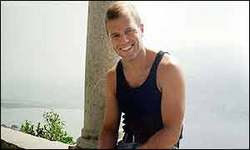 Today, I also remember Graham Andrew Berkeley in my part to assist with Project 2,996. Bloggers unite each year to remember those innocent lives lost on September 11, 2001. Graham Andrew Berkeley was murdered when the plane he was on, United Flight 175, was the second plane to crash into the World Trade Center. Graham was a Briton, born in Worksop Nottinghamshire, England to loving parents Charles and Pauline Berkeley. He loved life, this man with the amazing smile. As a young child, he showed a talent for music and took lessons. At the age of 14, he won the Shropshire Concerto Competition and became the leader of the school symphony orchestra at the same age. Equally talented in the more mundane of academics, music was his passion. He played violin and viola and studied at the Royal College of Music. A bit later in life, he found himself working for a US software company in Germany. In time, his skills developed further and he became a programmer and analyst. Eventually, he moved to the United States to pursue his career. He settled near Boston and worked t irelessly for 10 years to get permanent resident status. He was finally granted this status in June 2001, just before his death. He loved the United States and the freedom she offered. He loved the energy of New York City, where he was planning to move. The loved our open society and the many many friends he made along the way. This bigger than life character is missed dreadfully by co-workers, family, and friends alike who remember him as easy-going, a pleasure to work with. They remember an opera lover, a classical violinist, and a world traveler. The families of the victims of 9/11 have left virtual memorials all over the internet to their lost loves. Graham's family and friends have done the same, but one thing is clear and rings from each entry. Graham's passion for life was inspiring. He grabbed hold and held tight, whirling and twirling, but always true to himself. In the past eight years, I am certain that the pain in the hearts of those he left behind has lessened some. Not forgotten, surely, merely managed. There is no question that he is remembered, for in reading what has been written about him by his family, it is clear that he was unforgettable. I want to close with quotes from his memorial service. To us Graham was our ‘lark’, he soared high and made beautiful music. Every time there was a new business opportunity, by chance or by design, Graham and I seemed to be there together. Many people told us we were taking some big risks and making some bold moves. Well, I can tell you that for me, with Graham by my side, the risks somehow seemed smaller and I seemed somehow bolder. I remember Graham Berkeley, who was cut down in his prime but who could teach us all about living life passionately. May he continue to soar and make beautiful music in heaven. We will hear him in birdsong. If you want to remember Graham, please leave a comment. we will never forget, nor ever fully recover from this great loss. Beautifully done; thank you. 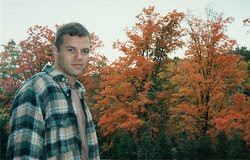 I honor Christopher Paul Slattery.